Acute otitis media is the most common bacterial infection in childhood. The peak incidence occurs during the first two years of life, especially between six and twelve months. 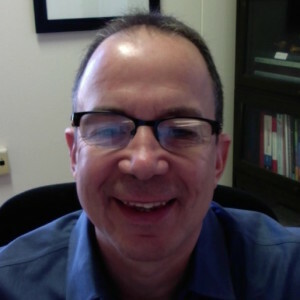 This increased susceptibility is likely due to the younger infant and child’s shorter eustachian tube, its horizontal position, their limited exposure to both bacterial and viral pathogens, and their limited response to antigens. Certain risk factors have been linked to a child’s increased prevalence of acute otitis media such as the winter season, genetic predisposition, day care, low socioeconomic status, males, reduced duration of breast feeding, and exposure to tobacco smoke. The predominant organisms responsible for acute otitis media are: Streptococcus pneumoniae, non-typable Haemophilus influenzae, and Morexella catarrhalis. Prevalence rates of infections due to Streptococcus pneumoniae are declining due to widespread use of the Prevnar vaccine. Streptococcus pneumoniae is often resistant due to penicillin-binding protein alterations. The resistance may be overcome with higher doses of Amoxicillin. A non-vaccine strain of Strep pneumoniae (Stain 19A) has become a concern due to multidrug resistance but coverage for 19A has been included in the new Prevnar 13 vaccine. Due to the pneumococcal vaccine infection with non-typeable Haemophilus influenzae is present in a greater proportion of acute otitis media. Haemophilus influenzae and Morexella catarrhalis are gram negative organism that produce beta-lactamase enzyme to inhibit antibiotic activity. Higher doses of antibiotics do not overcome their resistance. Group A beta-hemolytic streptococcus, Staphylococcus aureus, Pseudomonas aerogenosis, and respiratory viruses account for the minority of infections. Persistent effusion, relapse, and recurrence of acute otitis media are common, especially in the younger children and those with the most severe presentations. Approximately 30-70% of children treated for acute otitis media have middle ear effusions that persist for weeks to months. Hearing loss is the most common complication. It can be conductive and/or sensorineural, temporary or permanent and may lead to language delays. Suppurative sequelae of acute otitis media are rare. (Approximately 1-2/100,000/year.) The incidences of mastoiditis and facial nerve paralysis have decreased significantly since the widespread use of antibiotics but do occur in sporadic cases. Intracranial complications such as meningitis, abscesses and lateral sinus thrombosis are rare but may be life-threatening and have declined over the decades. 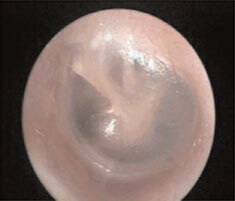 The diagnosis of acute otitis media is a clinical one without a gold standard. The diagnosis can be challenging especially in the younger patient, whose symptoms may be non-specific, have a concomitant upper respiratory infection, does not cooperate with the examination, or has cerumen obscuring the view. 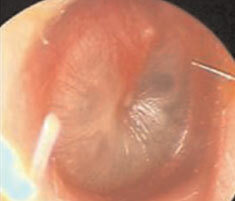 Erythematous tympanic membranes may be due to viral infection, crying, or efforts to remove cerumen. Fever or irritability may or may not be present. In 2013, the American Academy of Pediatrics revised their otitis media guideline of 2004. Emphasis is placed on appropriately diagnosing of otitis media. A treatment option for an “uncertain” diagnosis is no longer included. The option of expectant waiting has been expanded to younger age groups. Appropriate analgesia should be provided to all patients. A strategy of “watchful waiting” in which children with acute otitis media are not immediately treated with antibiotic therapy, has been endorsed by the American Academy of Pediatrics. Observation without antibacterials is a widely adopted practice in Western Europe without a significant increase serious sequelae. When observation is used, a mechanism must be in place to ensure follow-up and begin antibiotic therapy if the child worsens or fails to improve within 48 to 72 hours of onset of symptoms. Parents may be given a “rescue” prescription to facilitate treatment if symptoms persist or worsen. The studies on which the observation option has been based have been criticized for lack of stringent diagnostic criteria, small sample sizes and use of antibiotics in suboptimal doses. Two well-designed clinical trials (2011) randomized approximately 600 children meeting strict diagnostic criteria for acute otitis media to receive Augmentin or placebo. These studies demonstrated a significant reduction in symptom burden and clinical failures in those who received antibiotics. The authors conclude that those patients with a clear diagnosis of acute otitis media would benefit from antibiotic therapy. Amoxicillin is the recommended first-line agent to cover against the most common causes of otitis media. Due to increased prevalence of resistant strains of streptococcus pneumoniae, high-doses of amoxicillin (80-90 mg/kg/day divided BID) are recommended. If the incidence of strep pneumoniae continues to decline due to vaccination then antibiotics with greater activity against beta lactamase producing gram negative organisms may supplant Amoxicillin as the preferred first-line agent. Amoxicillin should not be used if the patient has received Amoxicillin in the past 30 days, has concomitant purulent conjunctivitis (likely H flu) or is allergic to penicillin. In these circumstances a beta lactamase resistant antibiotic should be used. These include: Amoxicillin clavulanate or 2nd or 3rd generation cephalosporins (including intramuscular ceftriaxone). Patients with a history of type 1 hypersensitivity reactions to penicillin should be treated macrolides. Studies on duration of therapy have shown better results with 10-day duration in children younger than 2 years and suggest improved efficacy in those 2-5 years. For patients older than 5 years, shorter course therapy (5-7 days) can be utilized.